Last month, PRI published the third report in its annual flagship series, Global Prison Trends 2017, which identifies topical developments and challenges in criminal justice and prison policy and practice over the past 12 months. The report included a Special Focus section which looks at the Sustainable Development Goals (SDGs) in relation to criminal justice. 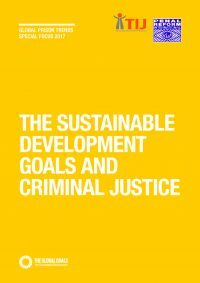 To mark the 2017 High-level Political Forum on Sustainable Development that begins this week – which seeks to strengthen and assess progress towards six of the SDGs – this blog by PRI’s Programme Officer Olivia Rope explains why criminal justice reform must form part of efforts to achieve the SGDs. People who come into contact with criminal justice systems are overwhelmingly ‘left behind’, as are their family members. The number of people we are talking about is not insignificant, with statistics showing there are some 10.35 million people held in penal institutions worldwide, and this figure is increasing. However, limited consideration has been paid and little data collected on the impact of criminal justice policies on development. The Special Focus section of Global Prison Trends 2017. This is why our annual flagship publication, Global Prison Trends 2017, sets out in its Special Focus section the links between criminal justice and the SDGs. It does so by drawing on illustrative examples and highlighting specific issues addressed in the targets and indicators. The most explicit recognition of the link can be found in Goal 16, which acknowledges that peaceful and inclusive societies and access to justice are essential to sustainable development. Without a fair and effective criminal justice system, Goal 16 will not be achieved. Prisons frequently have insufficient resources and capacity to fulfil their purpose, which is to protect society and rehabilitate offenders (thus making society peaceful). Pre-trial detention is common, preventing access to justice by impeding the presumption of innocence as well as having a significant socio-economic impact. Corruption in the criminal justice system, high levels of violence in prisons and a lack of transparency of institutions are relentless challenges the world over, as evidenced in other chapters of Global Prison Trends. But beyond Goal 16, there are other links with criminal justice reform. Goals 2, 3 and 6 on hunger, health, water and sanitation directly correlate to prisoners the world over. With prisons understaffed and under-invested, prison administrations often rely on charitable donations or families of prisoners to provide medicine and food to the prisoners under their care. Lack of sufficient and clean drinking water and poor hygiene conditions are common problems in prisons, causing diseases to flourish and dignity to be eroded. Grave consequences from the failure to provide for these basic needs of prisoners include starvation, premature death, the spread of infectious diseases within and outside of prison, and increased violence and corruption. Limited consideration has been paid and little data collected on the impact of criminal justice policies on development. Goals 1, 4 and 8 on poverty, education and economic growth and work are closely linked to preventing crime and reducing recidivism through social reintegration of offenders. People in prison or serving a non-custodial sanction are overwhelmingly poor and from marginalised communities. Poverty is a determining factor behind many offences, as is the high rates of pre-trial detention (not least because of unaffordable bail amounts or an absence of legal representation). Low levels of education and unemployment or low-paying jobs are also factors that contribute to poverty-related criminal offences. Efforts towards achieving these three Goals must include those who come into conflict with the law, in order to contribute to a more peaceful and inclusive society. Finally, as inequalities in society are mirrored in criminal justice systems, Goals 5 and 10 on gender equality and inequality within and among countries are also directly relevant. Gender inequality and disempowerment is widely recognised as a primary factor in women’s pathways to offending, as well as the continuing multi-faceted discrimination and violence faced by women within criminal justice systems. Penal systems are invariably designed for men, by men, and with ever increasing numbers of women being imprisoned there is a need to review and reform systems to ensure gender-specific responses to offending by women. Furthermore, the inequalities faced by minorities and Indigenous Peoples in criminal justice systems across all regions of the world manifest themselves in the disproportionate number being arrested and detained. Implementation of the criminal justice standards on the treatment of offenders and prisoners would go a long way to meeting the targets and Goals of the 2030 Agenda for people in contact with the law. All of these challenges outlined are closely linked to the overuse of imprisonment (as both a sanction and pre-trial measure). 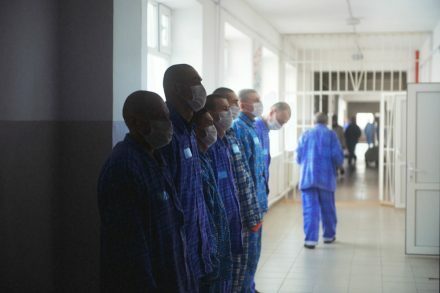 Where facilities are overcrowded (an issue in almost 60 per cent of the world’s countries), prison administrations cannot provide for the basic needs of prisoners or meet minimum prison conditions laid out in the Nelson Mandela Rules (the UN Standard Minimum Rules for the Treatment of Prisoners). Furthermore, they are unable to provide the necessary programmes to foster rehabilitation, let alone ensure the specific needs of different groups are met. Overcrowding is a result of penal policies, not an increase in criminal activity, as statistics show crime rates continue to decline. [ii] The overuse of imprisonment therefore must be tackled alongside efforts to improve prison conditions. Implementation of the criminal justice standards on the treatment of offenders and prisoners would go a long way to meeting the targets and Goals of the 2030 Agenda for people in contact with the law. These include: The Nelson Mandela Rules and Bangkok Rules, the Tokyo Rules on non-custodial measures, and the Beijing and Havana Rules on children. Global Prison Trends 2017 details the current trends and developments over the past year in the use of imprisonment, and should be read alongside the Special Focus section. It is hoped that the summary on the SDGs generates a commitment by states to include criminal justice and prison reform in their efforts towards achieving the 2030 Agenda. As a first step, PRI recommends that states include, in their data collection and reporting within the SDG framework (including the Voluntary National Reviews,) information on criminal justice systems and people in prison. Watch a short video outlining the objectives of the 2017 High-level Political Forum on Sustainable Development. The Special Focus includes an overview of international criminal justice standards that are relevant to the SDGs. See also Olivia Rope’s blog, HIV/AIDS in prisons can’t be ignored if the world is to move closer to the Sustainable Development Goal 3 on Health. [i] Transforming our world: the 2030 Agenda for Sustainable Development, UN Resolution A/RES70/1, paragraph 4. [ii] See Global Prison Trends 2017, p7. Olivia Rope is PRI’s Policy and Programme Manager. She is responsible for undertaking research on penal reform issues and the work of national, international and intergovernmental organisations, as well as advocacy and policy development on criminal justice and thematic areas of the organisation. How justice and penal policy reform are also relevant to and prerequisite for the achievement of many of the SDGs.